At Four Lanes Infant School children are at the core of all we do. We aim to work in collaboration with families to provide a ‘flying start’ to each child’s education. 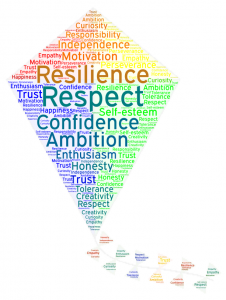 Our core values of CONFIDENCE, AMBITION, RESILIENCE, INDEPENDENCE, TOLERANCE and RESPECT are represented by our learning mascots to ensure they are meaningful to our children. Provide a safe, stimulating and supportive learning environment. Empower and inspire each child so that they know and believe they are capable of reaching their full potential. Provide an exciting and engaging enriched curriculum with appropriate challenges. Develop a sense of belonging within the school and wider community. Continue to develop positive partnerships with parents. Develop children as independent learners and thinkers. Provide outstanding teaching and learning opportunities for all children. Encourage each child to flourish as a whole person, developing confidence and respect for others.